In Happy This Year!, bestselling author Will Bowen offered his practical philosophy for achieving higher happiness levels. Now, through the fifty true stories in Happy Stories!, he takes you into the minds and hearts of some amazingly happy people so you can learn from their examples. You will meet parents, kids, business people, students, retirees, construction workers, nonprofit directors, educators, stay-at-home moms, artisans — as well as individuals from many other walks of life — all of whom are so happy that they were nominated by others for inclusion in this book. These are just a few of the remarkable people you’ll meet: • A certified Laughter Yoga instructor creates laughter flash mobs where happiness becomes contagious. • A boy in China experiences starvation firsthand and grows up to help feed the hungry. • A mother shares her happiness with her adopted son from Guatemala. • A special young woman becomes an unexpected choice for Homecoming Queen. Filled with wise tips and rich cultural tidbits, Happy Stories! 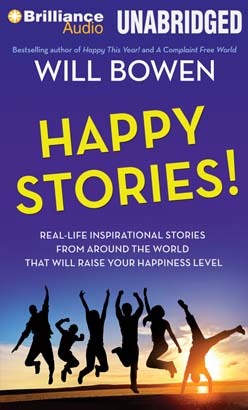 will inspire you to become happier as well as give you practical tools to increase your level of your happiness.